Pioneers in the industry, we offer vitrectomy lens set, vitrectomy irrigating lens set, vitrectomy infusion cannula, intraocular magnet, back flush flute needle and plug holding forcep from India. We are a reputed organization, enthusiastically engaged in offering an excellent performing range of Vitrectomy Lens Set that consists of a set of concave contact lenses, lens rings, prism and magnifying glass. The main advantage of this system is that it minimizes the dependence of a well-trained assistant. This lens set comprises of a set of contact lenses (with concave contact surface) and a ring to hold the contact lenses in position. Pioneers in the industry, we are offering a wide range of Vitrectomy Irrigating Lens Set that has a refractive power of -90D, a field of view of 24 degree. The offered lens set is designed to view the fundus in air-filled phakic and pseudophakic eyes. Also, our lens set is checked from our side before supplying to customer’s end. This lens set is available with us in diverse sizes and other specifications to meet the specific requirements of customers. This is an ultra thin wall cannula (20 G) with 45degree beveled tip along with a flexible silicon tubing. It is designed to provide more effective infusion than a regular wall cannula. The flexible tubing is 25 cm (10 inch) long and attaches to an infusion source. Both ends of the infusion cannula are strongly secured with the silicon tubing thereby making it an ideal instrument for silicon oil injection. It is recommended that the Infusion Cannula be disposed off after use of Silicon Oil. For atraumatic removal of magnetic foreign bodies. Posterior Segment Tips - 16g, 18g, 20g and 23g. This single piece device consists of a cap on one end and a shaft of a specified gauge on the other end. The shaft has a tapered tip which helps to insert the plug into the vitreous cavity. The cap which is bigger than the shaft helps in easy placement and removal of the plug from the sclera hole. Keeping in mind ever-evolving requirements of our valuable clients, we are offering Retinal Surgery. This product is manufactured under the supervision of professionals utilizing finest quality material & contemporary techniques. Our offered product is used in by the doctors and surgeons in the process of ophthalmology. Also, this product is checked in terms of quality before dispatching from our end. Aided by a team of qualified engineers, we are actively offering Steady Ring. Our steady ring has special 'tripod design' for better stability during vitreo retinal surgical procedures. The offered steady ring is manufactured from the best quality material & latest techniques following the standards of market. Moreover, this steady ring can also be customized as per the several requirements of our customers. This device is used in vitreo retinal surgical cases having opaque or injured cornea. This device acts as a temporary cornea during the surgery and is immediately replaced by a donor tissue after the surgery. This instrument is used for controlled injection of the silicon oil into the eye with minimal efforts. The syringe filled with silicon oil is loaded onto the injector. Slow rotation of the handle pushes the syringe piston forward injecting the silicon oil in the eye. Both 5 ml & 10 ml syringes can be loaded. Special attachment to firmly hold the Infusion Cannula in place. Silicon tipped needle (straight) : 20 G needle with a soft silicon tip for atruamatic removal of intraocular fluids. 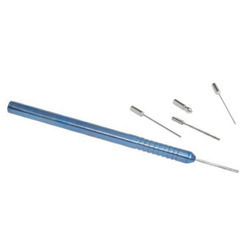 Silicon brush needle (straight) : 20-G needle with a soft silicon tip that is split to create a brush like quality. Useful for atraumatic brushing of the retinal surface with simultaneous aspiration. May be useful for repositioning of retinal folds or breaks. Looking for Retinal Surgery ?